As I was washing dishes this morning, my husband came up behind me and whispered into my ear. "Happy Thanksgiving!" I said to him, "Somehow that just took out all the romance of the gesture Dave." Poor Dave, he's been working in the garage too long. He's cutting out hundreds of pincushion bases for me. I think inhaling sawdust is affecting him. He said he was thinking of Valentine's Day as he was walking toward me....but it just came out Thanksgiving. I think he misses the kids and turkey. If turkey was involved in this holiday and the kids were here, I'm sure he would get it right. I've been laughing about it all day....at least he gave me a good story to tell all my friends. Of course we have to have a contest before Barb and I leave for Nashville. Be the first to get all the new Blackbird patterns. 5 sweetheart winners. Just leave your entry in the comments section and I will do the number generator thing and let you know before we leave. Please only one comment per person. You have until midnight Monday. We will announce the winners on Tuesday. And wishing you much chocolate, flowers and romance....and a turkey too! I love your designs! Please count me in on the contest! I hope I win this contest!!!! I love you ladies!!! I would love to be one of the winners! Your new book looks yummy. Oh, what a lovely idea for a contest! I love Valentine's Day and this would put the icing on the (heart-shaped) cake! Thank you for the opportunity to win. Love to have anything you want to give away. Love your new book coming out, can't wait. Count me in your contest ! I would love to be included in your contest, I never win anything, maybe this time round Valentine's Day will be my lucky day. So nice of you to do this for us! Please enter my name. I love your designs. Thank you so much for the chance. I think Dave was just being thankful that your his Valentine. I was at the Kindred Spirits Blackbirds Day it was Wonderful to see all the Beautiful Designs!! Would love to win some more!! Please count me in! Your too generous.... Happy Valentine's Day! What a wonderful giveaway! Please add my name to yur drawing! Thank you! Oh gosh! I so wish I would win for once!! Please pick me for your giveaway!!! I'm going to buy everything you release at market anyway, knowing me. lol! Sorry for the duplicate. I had a typo and couldn't bear to leave it and didn't realize it would still show me in the comment list. Just count me once for the contest. I can't wait to see your new book! Please enter me in your very generous giveaway. I'm going to be thinking about turkey all day today :) thanks for the giggle! Your post really made me laugh because that is something my husband would do, only he would have meant it! Please count me in contest! Your designs are the best! Happy Valentine's Day. I can't wait to see all your new patterns. I just love all your craft ideas. Please enter me in your contest! OMG! If I could choose just one time to win something, this would be it. Please enter me into the drawing. Would LOVE to win one of your designs. Thank you ladies! Please put my name in. Thank you and Happy Valentines! WOW, that's an AWESOME GIVEAWAY!! (course, yours always are! LOL). Poor Dave, but how cute is that?! Thanks for the giveaway and snicker! I would love to be the winner, I already picked out the book as my next must have!! Happy Valentine's Day Alma and Barb! Thanks for all of the sweet hours of stitching you give us each year! I love your husband's sentiment, even if the holiday was wrong, giving thanks is always right! Please add me to your drawing. I always love your books! Bet he was thinking Thanksgiving because he is thankful for you...Happy Valentines Day! and thanks for the contest! Wow! What a generous giveaway! Please include me, and thanks a bunch! What a wonderful and sweet gesture. Please enter me in your drawing. I love, love, love your designs. I am so looking forward to market being over with so I can see all the new designs coming out. Happy Valentine's Day or as your DH puts it....Happy Thanksgiving. What a sweetheart! Happy Valentine's Day. Would love to win your latest designs, such a generous contest. Please enter me in your contest. I love your designs. Ooooh, ooooh, I'm throwing my hat into the ring, too. Thanks for the chance! LOL at your husband's Thanksgiving wishes. I talked to my married brother this morning & wished him a happy V-Day. His response was, "Oh, I didn't even remember!" I told him he'd better remember before his wife woke up! 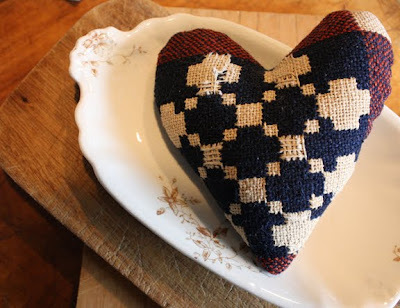 We are all thankful for your designs and this fun blog so I say Happy Thanks and Valentines Day!! !Sure hope I win!! Please enter me! Have a lovely time at Market! Love, love, love your designs! What a wonderful opportunity! I would love a chance! Thank you so much! count me in too & hope you had a happy "turkey" day. Oh what a guy!! LOL You had me chuckling! I would love to win the contest! Have a wonderful day! Please enter me in your drawing. I love your designs! What a generous prize! I have my fingers crossed! Have fun at market! Oh, lovely! And stuffing too? Please enter me in your most generous drawing! What a nice treat winning some of your designs would be! Thanks for the opportunity! Thanks for the giggle. You ahve to ask...Aren't you glad that he is "thakful" that you are there? oh thank you for this opportunity! Please add my name to your contest - would love to win. Have fun at Nashville and Happy Valentine's to you! I love your designs. Please enter me. Please include me in the drawing and Happy Thanksgiving!!!! I would to enter the contest! I am just loving the look of the new book and the other 2 designs you posted. Thanks for the chance. Happy Valentine´s day to you too.. and I have had almost all that goodness you wished us... chocolate...flowers...romance..... turkey...no chicken.. could that be good enough...lol.. Happy Valentine's Day! I would love to win!! Thank you for the chance. Looking forward to seeing all the new designs. I hope this is my lucky number! Happy Valentine's Day! I would love to win as I love your designs! Thanks for the contest what a great prize. I love reading your blog it is very inspiring. What a generous giveaway. I would love to be in it. Your designs are so lovely. Thanks for the contest...'twould be nice to win something, but it's always fun...what a nice thing for you to do! Happy Valentine's Day. What a sweet treat your patterns would be - any day of the year! I love your designs!happy Valentine`s Day. Please enter me in your drawing, I need a pick me up. I love your work and am looking forward to your new pincushions. Please enter me in your contest. I love all of your designs. Thank you. Thank you for holding this contest, I'd love to enter please. Sandra. Oooo please add me to your drawing - fingers crossed I hope I am lucky. I love your books and designs! It would be great to win. Happy Valentine's day and thank you for the give away, SharonJ. Happy Valentine's Day. What a generous giveaway. Hope I win. Thanks. What a hoot about your husband!! Please count me in on this fantabulous give away!! I would be tickled pink to be one of the lucky Sweetheart Five! What a great story! Happy Valentines Day to you, Barb and Dave. Please enter me in your generous giveaway. I'd love a chance! I would love to win such a wonderful contest. 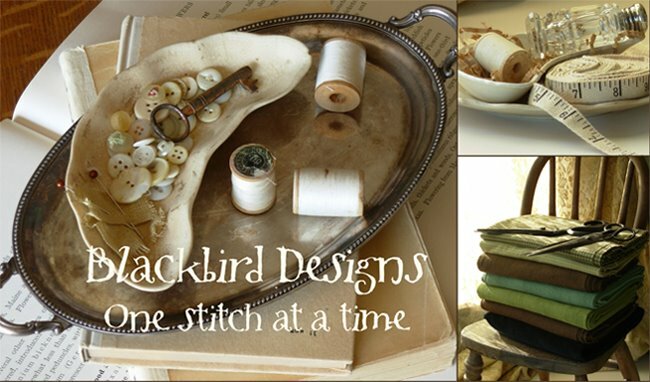 I love Blackbird Designs, I love your blog too. Thanks for the chance to win. Great, I love your designs. That heart pincushion. Is it choc brown thread on linen? Hard to tell, but looks good enough to eat! Everything you do is wonderful and I can't wait to get your book. Count me in on the contest. Hi Alma, Please enter me in your contest. Remember I can't for some reason leave comments on anyones blogs. Would love to win all your new stuff. Oh fantastic... please pick me random generator! Alma, I love your designs, and I'd love to win your patterns! Please enter me in the drawing. Happy Valentine's Day to you too! I love your husband story - that is one you will always remember I am sure. :o) I would love to be entered in your drawing. Oh, please enter me! I have all my fingers and toes crossed! I think that is a sweet and funny story! 84 comments so far. Good for you. Bad for me. But I would die for some of your patterns :) I have really been wanting to make a "Blackbird Design." Thanks for the giveaway! Oh Neat! A BBD giveaway! Please enter me! Had to laugh about the Thanksgiving comment. Oh well...the thought was there...and the dedication to be making all those pincushions. Can hardly wait to see more. Thank you for this wonderful give-a-way! Have a great time in Nashville. Please count me in - I would love to win!!! Can't wait to see all the new designs in the book!! Thanks for all your designs that keep us holding our breaths for the next one to come out! Just love your designs - and it would be wonderful to win this wonderful prize. Thank you for the opportunity and all your wonderful work. I love your story .... my husband would do much the same thing. As the same time it's my birthday, he can say two things and not likely to forget as we understand it everywhere! I'd be happy to participate in your drawing. I love your designs and the contest is a great idea. Have a great time in Nashville. Have a wonderful trip to Nashville. Winning your give away would be wonderful. Your designs are awesome. I have to enter this contest! I just love your patterns! Happy Thanksgiving (woops! ), I mean Happy Valentines Day! Happy Valentine's Day!! Love everything you do! Oooooh! I've been waiting on pins and needles for the announcement that the new designs are available! This would sure help witht he winter blues!!! LOL at your hubby, at least he knew he was supposed to be wishing you happy 'something'! Sounds like great fun, plz count me in! Would love to win these patterns, Love everything you design. Thanks for the chance. I would love to be included in your Valentine's giveaway. Thank you! I particularly liked your new Rewards of Merit patterns. Lovely! I always love your designs.....please enter me in your giveaway! I love your designs and wish I had them all! :) They are quite lovely and I am enraptured by the designs - so different and unique! Please enter me in the contest too? Would love to be the lucky one! Love both your cross stitch and your quilting designs! Am so looking forward to Nashville Market and release of new designs. Thankyou so much for the opportunity to enter this lovely giveaway. Please put my name in the draw. If I ever wished I could win a contest, this would definitely be it!! I'll keep my fingers crossed. Love your designs and can't wait for your new book! I love your designs. I so loved meeting you both at Heart's Desire camp. Good luck at Market, remember to have fun!! I hope I am one of the lucky winners of your generous contest. I love the "turkey" story, at least he remembered it was a "holiday". To My Favorite Designers…I love your patterns! I would love to win!!!! Please add me to the drawing! Happy Valentine's Day and thank you for the chance to win your latest book which I already love even though I've only seen a small part of it. Happy Valentine's Day! Please enter me into your contest. Can't wait to see all the new patterns! This is such an inspiring site. I love your Happy Thanksgiving story, it reminds me of home!! Please include me in your contest. Well, who wouldn't want to win something from Blackbird Designs?!!!! what fun and thanks for the chance! Oh great !!!! I am very happy if the computer could choose me !!! Thank you Alma and Barb. Happy Thanksgiving is better than no happy at all! New designs!!! I will have them one way or another. Win them now or get them at my favorite shop after Market it makes no difference - just cannot resist more Blackbird patterns! I would love to win your new designs. Enjoy market ! What a lovely post. Still giggling here about the Thanksgiving. Looking forward to see all your new pattern. Please enter my name in the drawing. What a beautiful chance. Happy Valentine's Day. Love your designs. Would love to win the new ones. I'd love to be entered in the contest! Wishing you a successful market. How exciting! I love your designs! Please enter me in the drawing. I love the new designs and can't wait to see the new book. Please enter me in the contest. I have been a fan of your designs for years ! Please count me in on your contest. What a Fan-tastic idea. Maybe Dave meant that he is thankful for you Alma-just a thought. I just love the new Rewards of Merit charts!! Please enter me in the contest. Thanks!!! Oh my, how I would love to win this contest. What a sweet day it would be. Just love all your designs and can't wait for their release. Thanks for your generosity and have wonderful time in Nashville. Happy Thanksgiving! Ha - that sounds like something my husband would do, only he'd say it on purpose. your designs are fabulous, please count me in your drawing. Your needlework patterns are so charming. I would love a chance to win. Thanks so much! Happy Valentines Day. That was a cute story about your husband. I would love to win. Sandi S.
I like the idea of turkey. Can we have stuffing too? I would be so thrilled to win your newest patterns ... already on the list at the LNS for Honeysuckle Manor and can't wait to see all the new ones! At least his heart is in the right place...he knew it was some kind of holiday. Even though the competition is always thick in your contest giveaways, I would want to miss all the fun and excitement. Please generate a number for me. I think you and Barb are the real winners. Have fun at market and bring back lots of fun stories and pictures to share. Oh my goodness, so many entries, but why not? Who wouldn't LOVE to win your newest book!? I know I sure would! I'd be THRILLED if I was to win the new pattern - I'll cross my fingers! I absolutely love your giveaways. I wish I could go with you to Nashville! Have a great time!! Lovely Valentine story - made me laugh a lot. It would be lovely to win your prizes. Fingers crossed! Well of ocurse I need to enter this contest! Looking forward to seeing you at Stitchville in April! You guys are so generous with your giveaway! And, of course, I love your patterns and would love to add them to my collection! Have fun at the show! Ohhh! I would love to win this one! Count me in. Looking forward to seeing your new designs, the new book looks lovely. I'm just stitching the Feb stockings at the moment and enjoying them so much. Would love to be entered into your contest please. Hop I'm the lucky one. Please enter me in the contest!!! add me to the growing list, I'd love to enter! Count me in on your latest contest!! Way too much fun. I don't know how you and Barb get so much done....but I LOVE IT!! Would definitely like to be entered in the contest, thanks! Happy Valentine's to you! Hope you have great market days! Please let me be a winner! Oh what fun -- a contest for things that I would really love to have (and don't worry if I don't win, I will order your new books.) Love all the things that I have seen. mmmmmmmm - Turkey sounds good to me! Happy Valentines Day - have a safe trip to Market and thank you for entering me in the contest. What a wonderful contest. Who wouldn't want all the new things!! Valentine's Day is sweet but this is sweeter!!! Please put my name in the hat for this contest. Please count me in, too. Thank you for doing this! What a great way to brighten up another cloudy/snowy day here in Kansas! Sky if finally clearing as the twighlight falls. OH well--maybe sunshine tomorrow--we can hope. It seems this has been the dreariest of winters in a long time. I am ready for spring and your new patterns! Oh, please add me in!! Thanks! Please enter me in the contest! I hope the weather is good in Nashville! I wish I could go somewhere sunny and a bit warm!!! Love a contest!! Especailly for your designs. Poor hubby ~ It's the thought that counts, and I'm sure you'll both laugh about it for years! Say hello to Nashville for me - I'm from there, but in Michigan right now. Hopefully not for long! Please enter me in the contest. Thanks and have a safe trip!! I just love all of your designs - cross stitch and quilting. This is a great contest. Count me in! I love the new Honeysuckle book! You are both very prolific designers. It is really fun to see what you come out with. Thanks! I completely forgot about Valentines day. I would be thrilled to win your prize. I love your designs and am working on one now. I enjoy your blog and your designs and would love to be included in your contest. Happy Valentine's Day! happy valentine's day! thanks for a chance at this sweet giveaway. would love to win. I love your designs and need more stash enhancement:) Please include me in the contest. I love every single designs you create. Please count me in your contest. "Je croise les doigts" means fingers crossed !! !